Unfortunately I was so excited to be finally building the bench I did not take many progress photos. Sorry 🙁 So there is only the partly finished and finished product to show you. At this stage(below) we had the frame done and were contemplating how to complete the bench top. We had planned on using treated pine palings, but these proved to bit a bit too flexible (flimsy). We decided to do the bench top with 150 x 25 rough cut, treated pine. 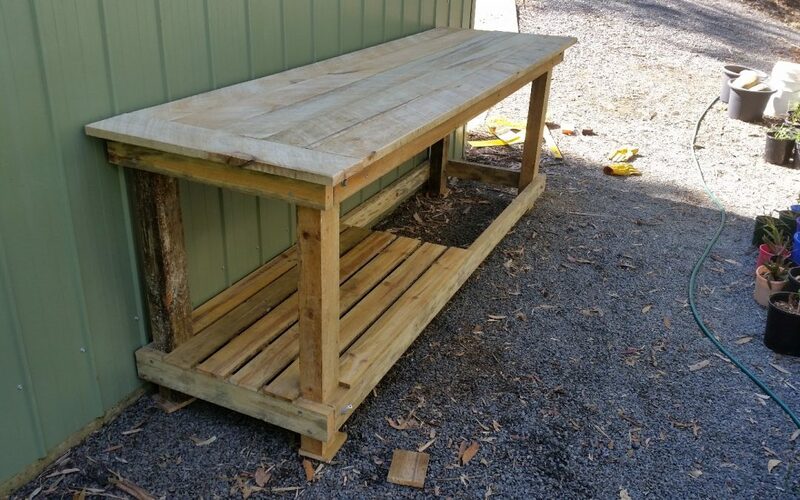 Despite a stupid measuring error on my part, the bench top went on and worked perfectly. Nice and strong and not flexible. You can see the final bench top in the picture below. The longitudinal frame was attached to the legs first with large galvanised bolts. This was done for top and bottom frames per each pair of legs. The two longitudinal frames were then connected with end cross beams, which were securely connected with 100 mm galvanised sleeper screws. 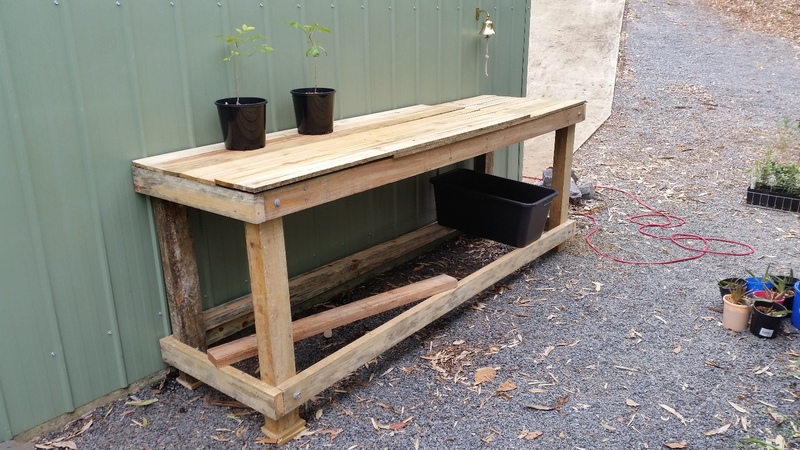 The bench top was supported by 4 cross beams of 75 mm x 37 mm treated pine, which again were secured with 100 mm galvanised sleeper screws. The lower shelf was supported by 2 cross beams of 75 mm x 37 mm treated pine, which again were secured with 100 mm galvanised sleeper screws. 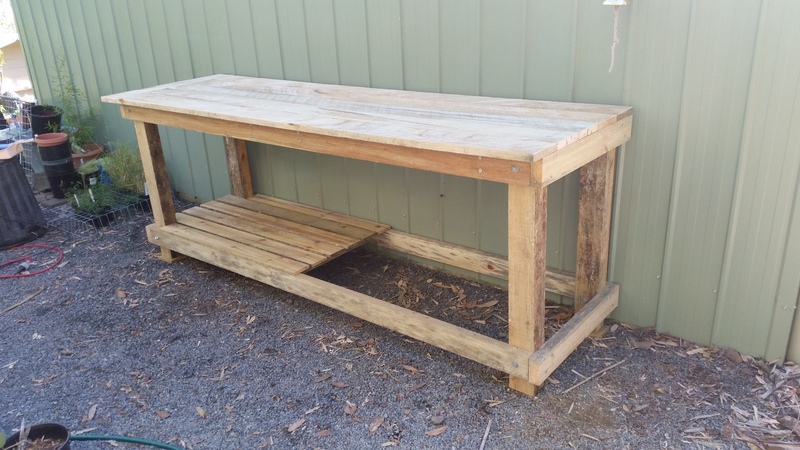 The bench top was completed using 150 mm x 50 mm treated pine, and nailed to the top of the frame. 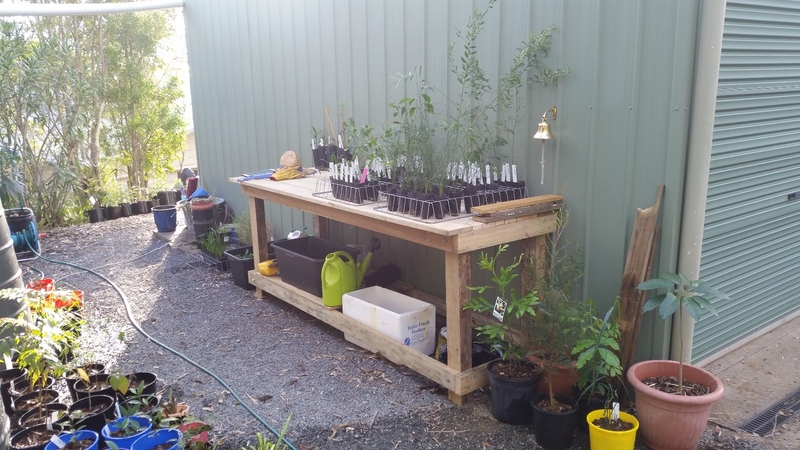 The lower shelf was completed using treated pine fence palings, and nailed to the lower frame. 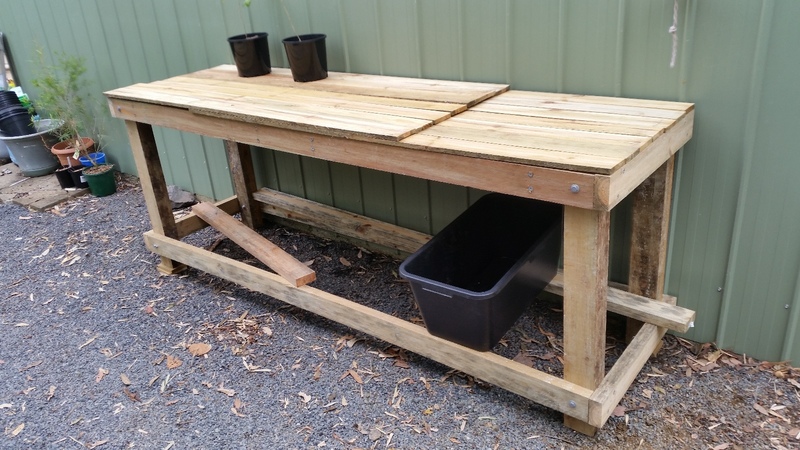 So the potting bench is complete, super strong and in use now. Once of the best projects we have done, and an absolute lifesaver for us as active tree and plant gardeners.